The First Congregational Church was instrumental in helping to found the “Supper on the Square” program in downtown Mansfield. 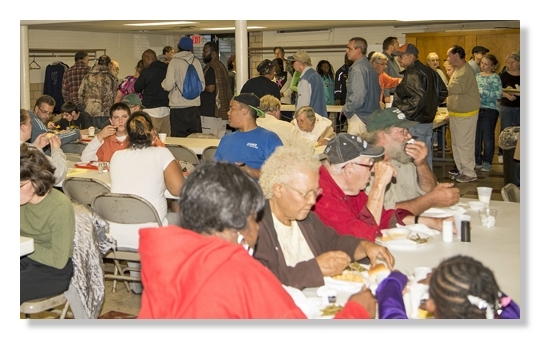 In conjunction with the First United Methodist Church, where the meals are held, 100-150 area residents are served dinner on most Monday evenings throughout the year. Our church provides the materials and staffing for the Fourth Monday of each month. The church’s Supper on the Square committee prepares the food each month, while each church committee or board commits to help with the serving, leg work, and dessert preparation one month throughout the year. Volunteers are welcome. If you wish to volunteer for "Supper on the Square", please contact the church office for details. Phone: 419-756-3046.